Hello everyone! This week for the Cutting Cafe Design Team projects, we worked with the Popcorn Box file and it is filled with multiple options like two sizes and styles of box, scalloped edging, printed toppers, and many different sentiments. I used confetti printed paper and a cut apart from the Confetti stack from DCWV. I added the scalloped top option and bling at top and around the middle. I also added a popcorn shape which is part of the file, and stamped just for you on it. You can fill this box with any goodies you like. It is easy to put together and there are so many options. 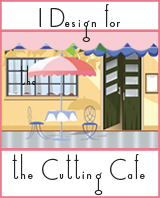 Stop by the Cutting Cafe Blog on the 7th and 21st of the month to see our design team posts. Leave a comment and be eligible to win three free files. Hello! It has been a while since I posted, or even crafted. We recently moved and I did not have time for anything but packing. I have not begun to unpack my craft room yet, but I dug some things out to do this project. For this posting of the Design Team of The Cutting Cafe, we could choose any file to work with as long as our project was about Christmas. I used the Snowflakes Kisses set which has two boxes, the treat box, which I used and a square box. The paper I used has holographic foiled snowflakes on it. I had some holographic bling so I added those to the centers of the big snowflakes on each side. The bling center is holographic to go with the holographic foiling on the paper. Don’t forget to head over to The Cutting Cafe Blog to see the design team projects. Leave a comment and you will be entered into a drawing to win three free files of your choice! Before you go, check out my video below. Thanks for stopping by! It has been a while. Hello! Today for my The Cutting Cafe design team project, I have made some cute pillow boxes with pumpkin cutouts. I used the Pumpkin version of the Halloween Pillow Boxes. I added an optional layer around the pumpkin and backed the opening with acetate. I added a resin leaf at the bottom for an accent. I used a resin leaf embellishment. I added a resin pumpkin as a knob to open the box.